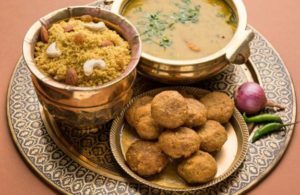 Rajasthan, the land of Raja’s (Land of Kings) having beautiful palaces also has lip-smacking food that has been traditionally adapted according to the availability of vegetables and water in the arid region. The tradition of hunting of the warriors and lifestyle of the local warriors influenced the cuisine in Rajasthan inventing innovative dishes that will surely insist you to lick the plate. Also, cannot be found elsewhere as tasty as in Rajasthan. It is the signature dish of Rajasthan and if you are a foodie, it is hard that you have not heard about it. The specialty of this dish is that it hardly requires any water for its preparation. The Baati is made up of grounded wheat cooked in ghee and Jiggery or sugar. This is served with daal made of dried lentils. Ker Sangri is one of famous and Traditional Rajasthani Recipes. 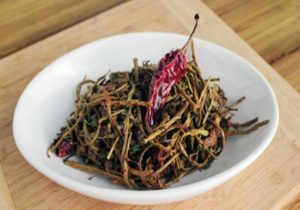 The two main ingredients of this popular Rajasthani dish are Ker, a wild berry known for its tangy and peppery taste and Sangri, a type of long beans that grow abundantly in the desert. It is either cooked in buttermilk or water. It has the history that this dish was first made when there was drought and local people took the sangria to cook it will oil and spice. 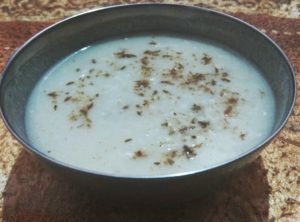 Raab or Raabdi is a Traditional Rajasthani made with millet ( Bajra) flour and fermented buttermilk. It is prepared by heating both the ingredients in an earthen pot in low flame for a long time until fully cooked. It forms a thick sauce that is eaten usually as soup. It can also be cooked using corn kernels in a similar process and the dish is called “Makke ki Raab” or corn raab. Every Indian meal is incomplete without a sweet dish. Ghevar is the traditional dessert of the desert. 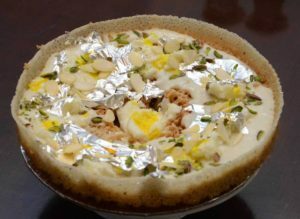 It is essentially a flour disc soaked in ghee and milk and cooked to make up a crunchy dessert that is topped with sliced almonds. Over the years, the people of Rajasthan have created a variety of plain, Mawa, and Malai Ghevar. Commonly known as red meat is a delicious non-vegetarian dish in the predominantly vegetarian state. It got its name from the red color that is the result of the spices involved in making the dish. It was traditionally made by using the meat of deer or boar but now it is prepared using mutton. 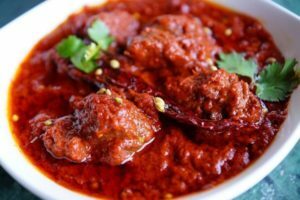 This spicy dish is prepared in low heat with a fiery sauce of red chilis, garlic paste, sliced onions, and curd.